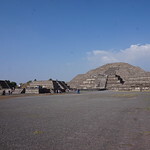 The most remarkable of the remaining monuments in stone of the peoples who successively or contemporaneously inhabited Mexico, are those well-defined and fairly well-known groups of ruins scattered at wide distances apart in the southern and south-eastern part of Mexican territory. 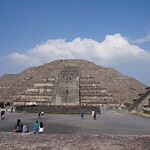 The principal of these are: Teotihuacan, at Texcoco, in the Valley of Mexico; Cholula, in the State of Puebla; Monte Alban and Mitla, in the State of Oaxaca; Palenque, in the State of Chiapas; Uxmal and Chichen-Ytza, in the peninsula of Yucatan. 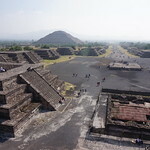 The ruins of Teotihuacan are situated in the north-eastern part of the valley of Mexico, some miles from the shores of Lake Texcoco and twenty-five miles from the modern City of Mexico. 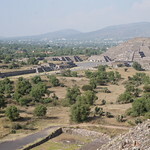 They are generally ascribed to the Toltecs, or, at any rate, to a civilised nation greatly previous to the Aztecs; for the ruins were abandoned and their origin unknown when these people arrived. Cortes and his Spaniards, defeated and fleeing after the terrible struggle of the _Noche Triste_, passed near to the great earth pyramids of the Sun and the Moon, which are the main structures of Teotihuacan; but even at that time they were--as they are to- day--mere mounds of earth, in which the pyramidal form has been partly obliterated by the action of time. 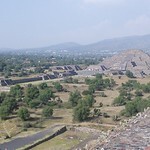 The very extensive mounds and remains which constitute Teotihuacan are of numerous pyramids, and some ruined walls which have been excavated of recent years. All of these are formed of adobe and irregular pieces of the lava of which the adjoining hills are composed. Rude carved monoliths of deities have, however, been recovered from the debris. 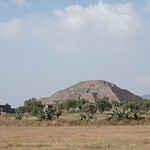 The main features of the ruins are, first, the "Pyramid of the Sun," a huge mound which forms the most colossal structure of prehistoric man in America. 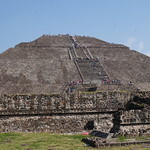 It measures, approximately, at its base--for its outlines are so indefined that no exact form can be adduced--some 700 feet on each side, rising upwards in the form of a truncated pyramid rather less than 200 feet above the level of the plain. 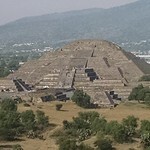 Next, the "Pyramid of the Moon," a similar but smaller structure--about 500 feet at base--distant from the first some thousands of yards along a strange road or path across the plain, known as Micoatl, or the "Path of the Dead," some two miles in length. 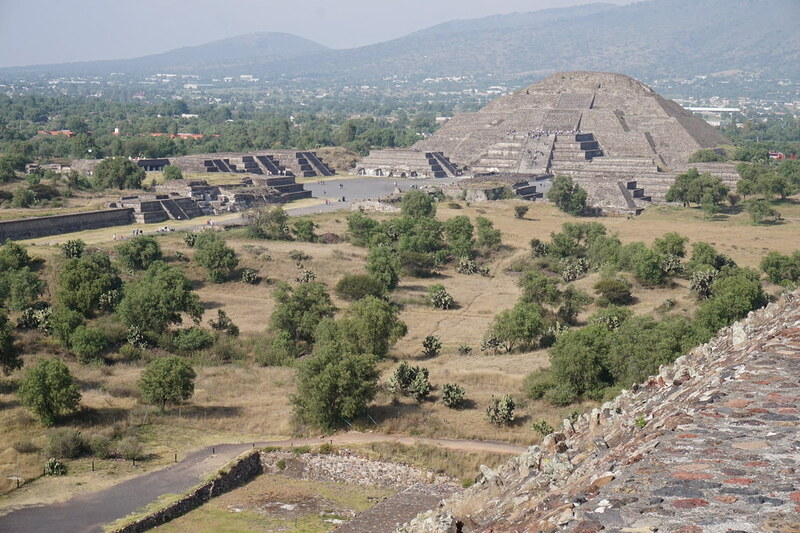 From the summit of the "Pyramid of the Moon" the beholder looks down into the great courtyard of an adjoining group of ruins; thence his eye travels along this pathway to where the huge "Pyramid of the Sun" arises, far off, on its left-hand side. 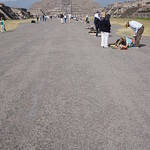 Between these and indeed beyond them, and bordering on the "Path of the Dead"--probably so called in relation to human sacrifice--are numerous other mounds, which were formerly pyramids of similar character, but of much less magnitude. Probably, in ages past, they were all crowned by temples, and ascended by staircases and terraces--evidences of which, indeed, still remain--whilst the slopes were probably covered with stone and stucco. It is stated that upon the high summit of the great pyramid--that dedicated to Tonatiuh, the sun--a huge stone statue of this deity was placed, and that a plate of polished gold upon its front reflected back the first rays of the rising sun. 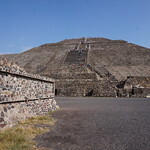 The name Teotihuacan signifies the "house of the gods." Doubtless it was, in unknown centuries past, the centre of a thriving civilisation and busy and extensive agricultural population. 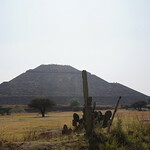 To-day the great pyramid casts its shadow toward a small village of jacales, upon a semi-arid plain.